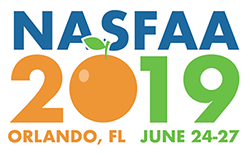 Attracting nearly 2,300 financial aid administrators and decision-makers annually, the NASFAA Conference provides four days of networking and professional development. The conference also provides an opportunity to learn about new products and services available to the financial aid community, as well as a multitude of exhibit and sponsorship opportunities. Find out why NASFAA Conference financial aid attendees are your target market. View the 2018 list of exhibitors. Learn more about the benefits of exhibiting at the NASFAA National Conference in this short video. The National Association of Student Financial Aid Administrators (NASFAA) is a nonprofit membership organization that represents more than 28,000 financial aid professionals at nearly 3,000 colleges, universities, and career schools across the country. NASFAA member institutions serve nine out of every 10 undergraduates in the United States. Based in Washington, D.C., NASFAA is the only national association with a primary focus on student aid legislation, regulatory analysis, and training for financial aid administrators. NASFAA conference attendees represent all sectors of post-secondary education including private and public 4-year and 2-year colleges/universities, and proprietary schools. With over 23,000 financial aid administrators receiving our daily newsletter email and with access to our website, this is the sure-fire way to reach your target audience year-round.